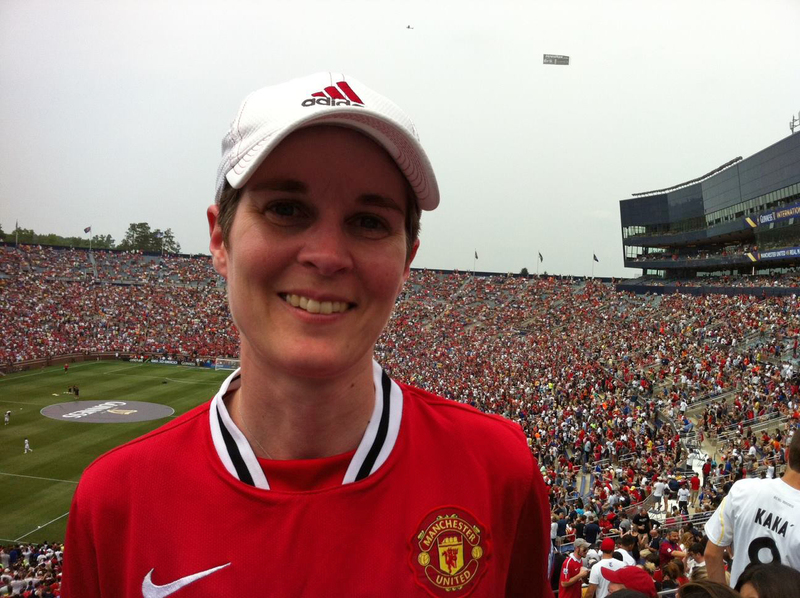 Ladies First Soccer – its all about the English Premier League! My name is Katie Doelle, and as a woman who is obsessed with football I wanted to create a blog that is informative, fun, spontaneous and something I can share with other fans. I am not a professional athlete, I am just a woman who, as a child, used to kick a football around the garden with her dad, and has played in the wind and the rain on a Sunday afternoon. I fell in love with the game (and Gary Lineker) while watching the World Cup in 1986. I decided to support Liverpool, then ten years later, made the cardinal sin of dropping the team and switching to Manchester United (something you are never supposed to do), but I did it any way and I am more than happy with my decision. I own numerous soccer shirts, have seven decorative footballs (much to my husbands disgust), and I watch every Premier League game on Saturday and Sunday, including Match of the Day (my favorite program) on Sunday morning – thank you NBC, and thank you for having an English studio and commentary team! I am English and moved to America 6 years ago. I love it here, but aside from my long suffering husband, I have very few people to ‘talk soccer’. With Ladiesfirst soccer I hope to inspire my audience with news, views, updates and stories about the beautiful game. Ladiesfirst soccer is for real fans, like you and me! Your husband is not disgusted by the seven decorative soccer balls on display on the fireplace mantle – he is simply worried about having to move to a house with bigger fireplace if you purchase any more of them…..